Anyone who’s spent time here probably knows I like music because I’ll link to songs that I’m loving or that get stuck in my head. Sometimes I even kind of think in song lyrics. 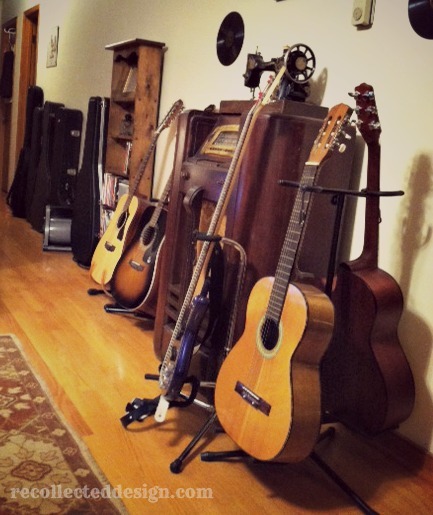 Anyone who knows me in person knows we own probably 13 guitars or more… and drums… and amps… and…. 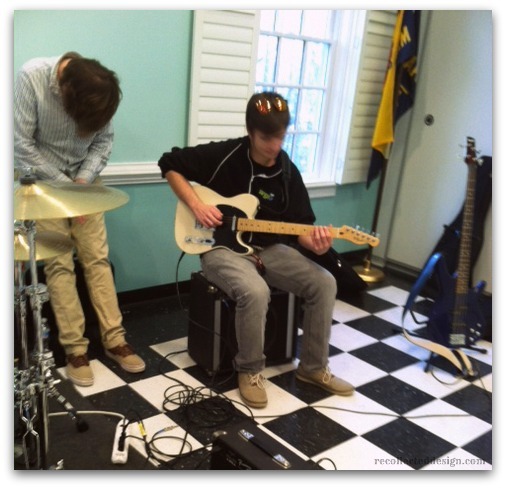 yeah it’s starting to get a little ridiculous up in here… I play guitar and so does the boy. One of the first emails I remember writing to my now husband was that I LOVE LOVE LOVE music. All kinds. Playing and singing. That first year when we met I was playing a lot (besides exercising it’s the best free therapy you can get!) and I even entered a little open mic contest (cue cold sweats…) and…won. Granted it was only free chicken but a win is a win…! Over time our new little family bonded over concerts and you tube videos. Dailey and Vincent, Jack White and J. Roddy. Playing at home and at church. As I dove into sewing the last couple of years I drifted away from playing and singing as much and started to feel like something was missing. Admittedly I really hadn’t been making as much music as I used to because between dishes, food, family, sewing, exercise and sleep (and ok, maybe a little laziness…) I just couldn’t seem to make any time for it. But there’s something musical brewing on the horizon this year I think. Sometime last fall our pastor approached us about putting together a praise band. 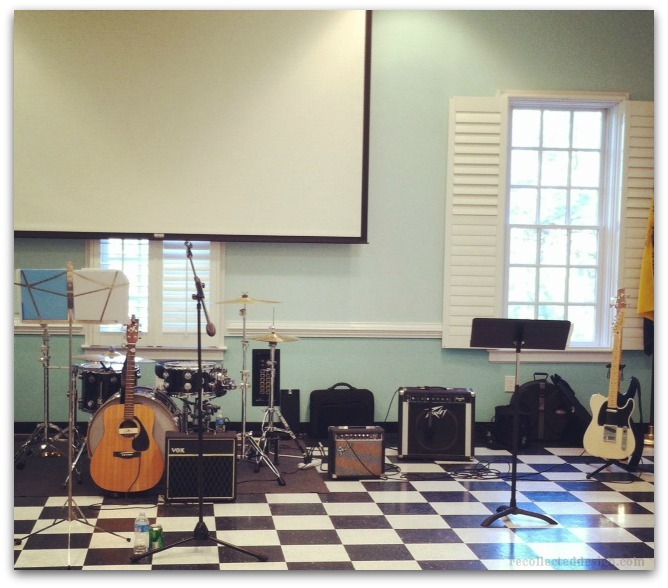 Historically we’ve kept it small and acoustic during our regular services when the need arose. But he’d been praying about doing a different type of service to reach out to some new folks and maybe rekindle a new spirit in other folks. So tomorrow night our little rag tag group- made up of the boy, his best friend, their favorite drummer friend, me and my long time singing partner in crime- will lead with song in a contemporary service. It’s so out of the realm of anything I’ve ever done before (hello amplification!!) but I’ve been shown in the last few days that God will definitely multiply our efforts if we just obey. Would y’all be so kind as to pray for it?! There is little we can offer in the realm of perfection, but God says to seek Him and offer up a sacrifice of praise. And if he sings over us, then how much more should we sing over Him? As I’ve been praying and preparing for tomorrow, these stories in the bible of how armies fell when God’s people marched out to meet the battle with singing and how fortified walls of cities were ruined with just a blow on a trumpet and a shout started coming up in my memory. I’ve got a couple of walls of my own I’d like to see fall in respect to some work and other life issues (ahem willpower and motivation…I’m talking to you!) and as I keep circling some of the same ground over and over I get this sense that I need to lead with some music. I need to lead by stepping out on faith. (by the way if you clicked on that link above you’ll see a little tangible evidence of some other stepping out I did recently..!) I need to lead with that which praises God. Because if I’m seeking Him singing his praise instead of manufacturing my own answers to my problems, I can’t go wrong. Favorite music? Tell me! Ready, set, go! Thanks for the encouragement Levi! We like all kinds of music too! The boy has a record player and he’s been buying Elvis records and Andy Griffith gospel lately!! Hope your week (home?) is well! Aww thanks : ) sounds like some more great times to come for you! Will be in prayer for you as well! I think your new adventure leading praise music sounds so exciting and I can’t wait to hear more. I’m not very musically inclined but studied piano for years and even played for my church for a year but I just hated it! This new opportunity to lead others and offer your songs back to God is so exciting! Hi Miss Valerie! Thanks for your sweet words! I’m sorry the piano at church didn’t work out, but hopefully it didn’t dampen your spirit for playing for fun! That’s one instrument I wish I’d learned to play!